The Asiana Visa Signature Credit Card currently has an Informr score of 8.1 out of 10. This score is based on our evaluation of 7 sources including reviews from users and the web's most trusted critics. Asiana Visa Signature Credit Card is typically available to those with good credit scores (650 or greater). 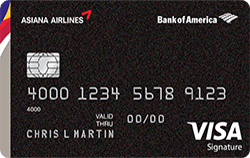 This card is best for those who love to travel on Asiana Airlines and can benefit from the many anniversary bonuses the card provides, especially if you spend a lot on groceries and gas to boost your points accumulation. The Asiana Airlines American Express card offers an above-average mile-earning scheme and a few other benefits worthy of your consideration. In addition, Asiana Airlines is a member of Star Alliance, which means you can use Asiana Club miles to fly on nearly 30 airlines anywhere in the world. Asiana Airlines travelers will definitely get their money’s worth from the Asiana Visa Signature credit card. But if you don’t live near an airport that services Asiana flights or don’t travel to Asia for work or pleasure regularly, you’re likely better off with a different card since you won’t be able to take advantage of the card’s most valuable perks. Designed for people who regularly travel to Korea or other parts of Asia from the United States. That’s a large and growing cohort. And, though this card has a much lower profile than branded credit cards from U.S.-based airlines such as Delta and American Airlines, it offers valuable access to Star Alliance routes that extend far beyond Asia. The Asiana Visa Signature is a good choice if you fly often with Asiana Airlines, as it offers a decent 3 miles per dollar spent on Asiana purchases, along with other ways to earn miles. But consider whether your yearly spending creates enough bonus miles for you, since the card comes with a $99 p.a. annual fee. You can pool your miles between up to five family members. And you can apply for more than on of the Asiana cards, so you are capable of earning multiple sign-up bonuses and be able to quickly boost your miles balance. Doing this will help you maximize your earnings. For those who travel with Asiana Airlines at least once per year, this credit card is well worth the $99 annual fee. Even if the airline does not fly your particular route, you may be able to book a flight through one of the other 26 Star Alliance airlines.